No one knows pattern like Orla Kiely. Gabrielle Fagan catches up with the Irish designer to find out how it can make you happy. 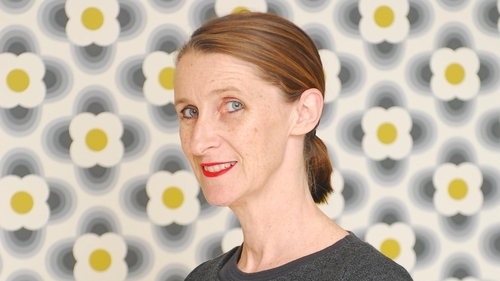 Orla Kiely’s renowned globally as the Queen of Prints – and it’s a well-deserved title. The mother-of-two, who began by designing hats and handbags in the early 90's, has seen her retro motifs – most famously stems and pears – adorn everything from housewares to wallpaper and clothes. Her latest book, A Life In Pattern: And How It Can Make You Happy Without You Even Noticing, coincides with a major exhibition, Orla Kiely: A Life In Pattern, at The Fashion and Textile Museum, London, until September 23, 2018. What first inspired your designs? "Growing up just outside Dublin, I was aware of nature and I loved art at school. I’d always wanted to do fashion at art college – my sewing machine was my most treasured possession – until I discovered the option of printed textiles. "As a student, I was very drawn to architecture, which influenced my earliest print designs, the strong geometric lines dictating how the pattern would work was something I loved. These early influences are still there, often informing the structure of repeats throughout." "If I am ever asked when we first started our label, I think back to working at my kitchen table, designing handbags with Robert, our baby son, on my lap. I had a full-time position as a print designer in the fashion industry on a freelance contract, so those moments were usually after work on the weekend. "We lived in a purpose-built, first floor Victorian flat, which doubled up as a design studio, office and distribution centre, where boxes of stock were delivered and turned around while I was at work. "Every day, my husband, Dermott, who had the business skills and entrepreneurial tendencies, would do all the jobs a strong team would normally do, in an office shared with Robert and his toys. "We financed it ourselves from day one and our lives were invested. Our second son, Hamish, was born – and nothing could have been more motivating than our two little boys depending on us for their all." Where do you get your ideas from today? "Nature’s a great source of pattern ideas. My personal take on nature has always been more abstract and graphic. I absorb inspiration in my travels, reading books, films, going to exhibitions, it never stops. Everyday objects inspire too, they can be interestingly random, which I love. I’ll spot something and store it away for the right moment." "It’s clean, controlled and orderly. It has a strong, bold graphic style, where colour plays along. As a design company, we’re always drawn to modernist/mid-century design and print. This has informed all aspects of our product, from the ready-to-wear collections, fragrance, beauty, handbags, watches, jewellery, homeware, wallpapers and more. "Our style will always remain quite Sixties and Seventies, but our colours and prints continue to evolve – and we’re always open to off-piste influences for a quirky twist." "I can’t help but say Stem, the simple organic leaf motif. The idea arrived as an inspiration while developing new print designs back in 2000. It was, as all good things often are, a very quick sketch. It has, for some reason, touched many people throughout the world, and became the seed from which our brand flourished. "I always think it’s serendipitous, as it so resembles a rowan branch, and Rowan is the family name of my husband and children. It’s proved to be very versatile and has morphed into an array of different variations – I always get excited by the newest iterations." How would you describe your own home décor? "My home is Victorian with a very mid-century aesthetic, original features, cornices, high ceilings and fireplaces. I’ve combined vintage furniture found in fairs and second-hand furniture stores with products we’ve made. "Growing up in Ireland has had a big influence on my taste for colour. My love for green, from moss to seaweed, the greys and browns of those rainy Irish skies, the mustard and orange of the wildflowers found on the roadside, have become my palette. I mix these with some other bright pops of colour, like pink and yellow. "Our patterns are present in every room, whether it’s a printed cushion, wallpaper or ceramic, an element of my work will be there. In the kitchen, our tableware adds something special at dinner times, and our towels in the bathrooms add that extra colour and pattern to everyday life." How do people create a successful interior? "Consider the space and light of the room. Think of those colours that you love the most. Research design eras you love, visit flea markets, vintage fairs and off-beat stores. Find a piece you love – this could be a couch, a table, a light – be open minded. These objects can inspire and set the tone of where the other rooms can follow. I like to commit to an idea and don’t water it down. Colour and print are very important, it can lift your spirits like nothing else. Most of all, don’t be afraid. "People have embraced more and more the expression of individualism throughout home interiors. Customers now, will wallpaper entire rooms in our prints and are much more fearless with how they mix their colours."